Frozen Fiefdom - Area 51. There's Something Out There. As my birthday approached in March, it appeared to be an ideal time to make a trip over to The Big Government Cookie Jar. You might have heard the name; it's called AREA 51. I've been out to that area previously, and it was also a topic which those who interviewed me in June of 2007 brought up. Apparently, they wanted to be sure I hadn't seen anything while I was in that area in 2004. When the Mother Ship makes the next flyby; I'm volunteering to hop aboard and make a trip through the time warp to the Pleiades. I didn't see anything during that visit, but there is much more to the story. Why would I be asked so many questions if ET doesn't exist? Shor Nuf were more than a few questions about what's and where's; if "Nobody" isn't hiding something. The Feeders had many questions about ET; if he phoned, Verizon dropped my call. Perhaps my phone was zapped, not tapped? Using a cellular phone is broadcasting yourself, and a GPS location chip is built right into my phone for the 911 system. I'm not concerned about who says what when I'm on the yap line; I rarely use it. The radar screen knows where my phone and thousands of others are 24/7. Telepathic communication is much more advanced, and static and poor reception are never experienced. I see heads nodding on that one! "Roger that, ET. Beam me up at 22:00. Rose Out." As I recalled that part of the interview, I decided that another trip was in the cards. With so much keen interest by so many, I might have missed something! With Vegas being nearby, and my 44th birthday galloping ahead of me; I was hoping to "Get Lucky" in one way, or another. I know where the gas hose goes on my Chariot, and that's about it. Thought it would be a good idea to bring along some "Sand" in case I had a mechanical failure. I wrote and posted another ad to see who might want to get on board for such an adventure. Plenty were interested, sight unseen! I'm not sure if it was the slightly suggestive nature of my poem, or the idea of doing something different on a date. (Click here for Poem # 34 The Birthday Party Tree) Not much traffic on the ET Highway at times, although someone stole the road sign at the intersection! It's about an 8 hour drive from L.A., and I decided the "go with what you know" approach would be the most sensible, so I invited Rob along. I knew he was intelligent, and would be quiet if I asked him to be. Sometimes we gals don't want to talk, or listen either. Photo of the sign from my 2004 trip Click Here. From Highway 375 ,The Extraterrestrial Highway, one views a scenic expanse of dry earth, cacti, rocks, and assorted critters; spanning miles upon miles out in the Nevada Desert. The Good Stuff is not accessible to the public. It's over near Groom Lake, which is secured by the various entities. I looked at the photos on the web prior to leaving L.A., as hiking up Tikaboo Peak wasn't going to happen. I can get lost in a parking lot and wasn't going to take any chance getting lost in a place where those who might find you are not from any Search and Rescue Team. Rob proved to be an inadequate navigator, so I was pleased that I had listened to myself about not hiking with him. Stargazing and UFO spotting from the comfort of the car or sleeping bag was my plan, and it worked out well. I had prowled around on Google Earth to see if anything new had sprouted since my last trip to the area, with the starting point of Rachel, Nevada. It's a must see stop if you are that close. Buy an item at the bar/grill/tourist shop combo of the Little A'Le'Inn. I've started a coffee mug collection, and given a few as gifts. Conclusion: It appears to me that there's a whole lot going on, out in a place where not much is. As my birthday approached in March, it appeared to be an ideal time to make a trip over to The Big Government Cookie Jar. 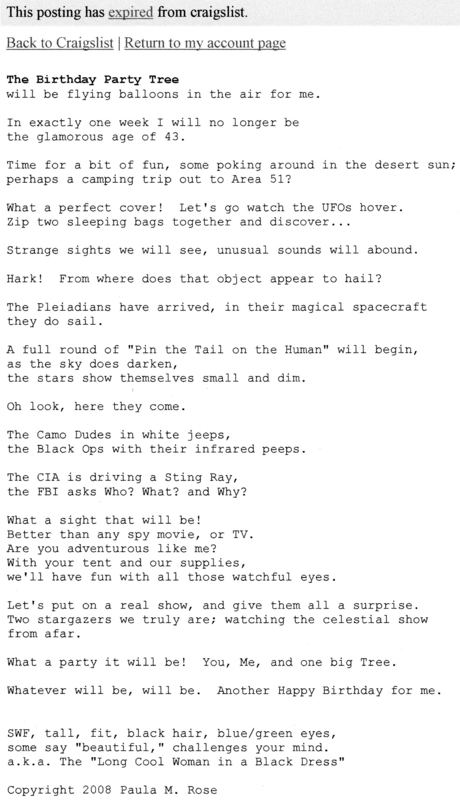 You might have heard the name; it's called AREA 51. I've been out to that area previously, and it was also a topic which those who interviewed me in June of 2007 brought up. Apparently, they wanted to be sure I hadn't seen anything while I was in that area in 2004. When the Mother Ship makes the next flyby; I'm volunteering to hop aboard and make a trip through the time warp to the Pleiades. I didn't see anything during that visit, but there is much more to the story. Why would I be asked so many questions if ET doesn't exist? Shor Nuf were more than a few questions about what's and where's; if "Nobody" isn't hiding something. The Feeders had many questions about ET; if he phoned, Verizon dropped my call. Perhaps my phone was zapped, not tapped? Using a cellular phone is broadcasting yourself, and a GPS location chip is built right into my phone for the 911 system. I'm not concerned about who says what when I'm on the yap line; I rarely use it. The radar screen knows where my phone and thousands of others are 24/7. Telepathic communication is much more advanced, and static and poor reception are never experienced. I see heads nodding on that one! "Roger that, ET. Beam me up at 22:00. Rose Out." As I recalled that part of the interview, I decided that another trip was in the cards. With so much keen interest by so many, I might have missed something! With Vegas being nearby, and my 44th birthday galloping ahead of me; I was hoping to "Get Lucky" in one way, or another. I know where the gas hose goes on my Chariot, and that's about it. Thought it would be a good idea to bring along some "Sand" in case I had a mechanical failure. I wrote and posted another ad to see who might want to get on board for such an adventure. Plenty were interested, sight unseen! I'm not sure if it was the slightly suggestive nature of my poem, or the idea of doing something different on a date. Not much traffic on the ET Highway at times, although someone stole the road sign at the intersection! It's about an 8 hour drive from L.A., and I decided the "go with what you know" approach would be the most sensible, so I invited Rob along. I knew he was intelligent, and would be quiet if I asked him to be. Sometimes we gals don't want to talk, or listen either. Photo of the sign from my 2004 trip Click Here. 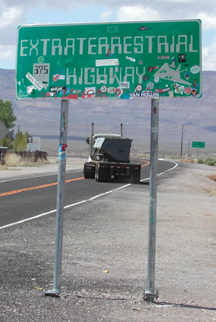 From Highway 375 ,The Extraterrestrial Highway, one views a scenic expanse of dry earth, cacti, rocks, and assorted critters; spanning miles upon miles out in the Nevada Desert. The Good Stuff is not accessible to the public. It's over near Groom Lake, which is secured by the various entities. I looked at the photos on the web prior to leaving L.A., as hiking up Tikaboo Peak wasn't going to happen. I can get lost in a parking lot and wasn't going to take any chance getting lost in a place where those who might find you are not from any Search and Rescue Team. Rob proved to be an inadequate navigator, so I was pleased that I had listened to myself about not hiking with him. Stargazing and UFO spotting from the comfort of the car or sleeping bag was my plan, and it worked out well. I had prowled around on Google Earth to see if anything new had sprouted since my last trip to the area, with the starting point of Rachel, Nevada. It's a must see stop if you are that close. Buy an item at the bar/grill/tourist shop combo of the Little A'Le'Inn. I've started a coffee mug collection, and given a few as gifts. Conclusion: It appears to me that there's a whole lot going on, out in a place where not much is.